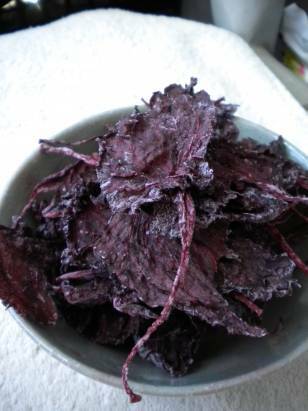 While this year's batch of umeboshi are dried and stored, I'm still working away at the shiso leaves. What I didn't know last year was that the red shiso (aka shiso in Japanese a.k.a. 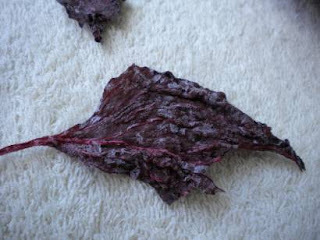 perilla) leaves that stew along with the ume (Japanese plums) also have a use. I knew the vinegar leavings made excellent quick pickles (daikon for sure and at the moment I'm experimenting with a few thin slices of zucchini since now is not daikon's time), but the leaves were a mystery. I kept them for a bit, but then added them to the compost heap with feelings of regret. It didn't seem logical that this great salted edible should have no purpose, but I couldn't find information any where. What I learned upon visiting a farmer's market and talking with a vendor there selling ume jam and umeboshi (made by his mother and all organic) is that the leaves are indeed kept. Dried and then crushed they become furikake. Furikake, a garnish sprinkled on rice, comes in a wide variety of shapes and flavors, but an umeshiso one seems pretty common given what I see on supermarket shelves. Setting the leaves to dry is not necessarily difficult but it is mildly tedious. The leaves, of course, are wilted and wet. This makes them a little difficult to unfold and spread on the zaru (round basket) for drying. Invariably some tear or remain in clumps. As I've mentioned before I'm a bit lazy, so I let the really difficult ones remain clumpy. I'm going to eat them anyway, so it doesn't really matter. The first round I left to dry as long as the plums, which was about four days. A heat wave blasted the city during that time, which helped the process along rather nicely. It's cooler today, but the second round seems to be coming along just as nicely. Once I'm satisfied with their level of 'crispiness' I'll hand shred the leaves, cut up the stems and put them in an airtight jar. For now I'm keeping it in the refrigerator since a bout with food poisoning last year still has me paranoid. I imagine as dried and salty as they are they would be just fine in an airtight jar on the counter, too. The flavor, by the way, is amazing. Tart, salty, and a little sweet with that zing that only shiso has I am pathetically happy with this experiment. So happy, in fact, that I may do a double batch next year! Got a cool experiment in the kitchen that went well? Let's hear it! It's crazy tasty, which I'm pleasantly surprised about. I thought it might be too salty at first, but I love it. Although this latest round does NOT love the typhoon weather and humidity. Not crispy any more, I'm afraid. We'll both just have to wait it out.